Vote for Olympia&apos;s Nominees in King 5 "Best of Northwest Escapes"
King 5 Evening has announced the Olympia area’s Giant Metal Cows as one of Western Washington’s top Roadside Attractions and Ranch House BBQ as one of the top Road Trip Eats in its Best of Northwest Escapes viewer’s poll of the best regional getaways. 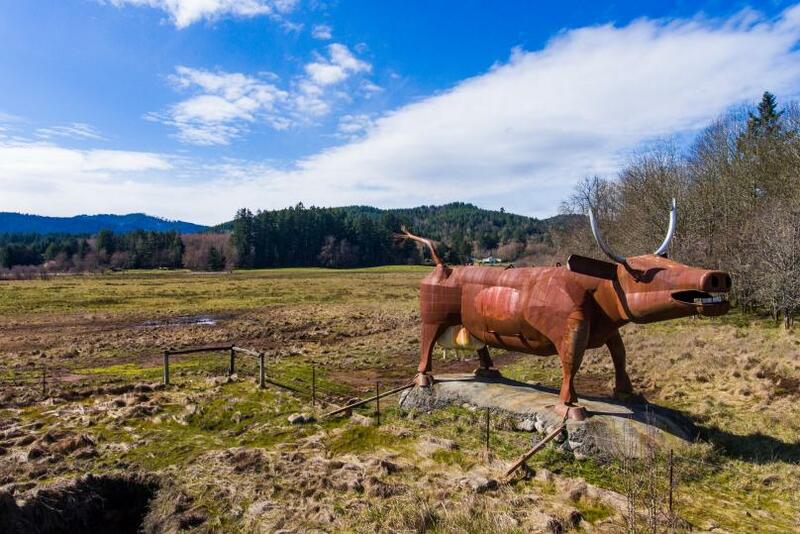 The giant sculptures are located on the south side of Highway 101 west of Olympia, welcoming visitors from the coast to this decidedly different destination. Love the friendly cows as much as we do? Enjoy the flavorful BBQ of Ranch House? Cast a vote for these local gems at this link. Inspiration from this interstate icon, the delicious outdoor staple food, and the warming temperatures have us dreaming of the open road, sights to see and bites to find. See our top five road trips using Olympia as your home base. Head out this weekend, chart a spring break plan or plan ahead for summer. Surfs up at Washington’s Beaches. Spot the aforementioned Giant Metal Cows on the way to Westport. Head 70 miles west from the Olympia region to Westport, a seaside spot that is quickly becoming known for its big waves and friendly community. Rent a surfboard and gear, bring your own or just set up shop on the beach to watch the experts hang-ten. See signs of spring along the Bountiful Byway. Farms and Farmers Markets are beginning to share early spring crops, which means visitors may find fresh peas, asparagus, greens and more to bring home. As the weather continues to warm, the fields and markets around Olympia create a tasty journey. Chart your course using the Bountiful Byway’s self-guided tour map and craft your own adventure based on interests like beverage tasting, touring local farms or unique and historic stops like Wolf Haven International(by appointment only), Evergreen Valley Lavender Farm (opens June 14), Lael’s Moon Garden Nursery and more. Meet these Small Towns. You’ve heard of our state capital, but how about Rochester, Tenino or Bucoda? Take a drive into the area’s rural communities and discover that small town charm still exists just a short way from Seattle’s hustle and bustle. In Tenino, find hand-carved, sandstone treasures and watch them being made or make your own with classes taught at the Stone Carver’s Shed. Taste local wine at Scatter Creek Winery or Sandstone Distillery. Nearby, don’t miss Volunteer Park in Bucoda. Grab your pole, some bait and spend the afternoon fishing along the Skookumchuck River. In Rochester, test your luck, catch a show or enjoy a delicious meal at Lucky Eagle Casino & Hotel. Meet Mount Rainier’s Wildflowers. Head for the hills on a trip to Mount Rainier National Park for possibly the northwest’s best wildflower viewing. Pack a picnic lunch with local fare from the Olympia Farmers Market (open Thurs-Sunday, April-October) and road trip it for an hour and a half to the park. Plan ahead for this one as wildflowers typically reach their peak from Mid-July to late August, depending on how fast the snow melts. This iconic Washington-state park offers a range of trails and areas to explore, this handy list from Visit Rainier lists the Top Ten Wildflower Hikes. Enjoy plenty of time to explore before returning to town for dinner and night in the town, or a good night’s rest. Take a Scenic Selfie Tour using the recently installed “Selfie Spots” as a guide. Visitors will find historic and iconic locations like Tumwater Falls and Heritage Park Fountain near the waterfront to under-the-radar, locally loved locations like the Rainier Mural or Shipwreck Beads. Plan a route of snap-worthy sights or challenge yourself to visit all 20. Find the full list, along with tips for taking your best shot from a New York Times photographer at this link. Follow along to find out the Best Roadside Attraction winner using #BestNWEscapes and tag @KING5Evening. Show us your road trip adventures using #DecidedlyDifferent and connect with us on Facebook, Twitter (@Experience_Oly) and Instagram (@ExperienceOly).